An MBLEx practice exam can be found below along with information about our study guide and MBLEx test prep products. This is only a 30 question sample test to give you an idea of the quality of our study aid. Answer each of the MBLEx review questions covering Anatomy & Physiology, Pathology, Body Systems, Business & Ethics, Massage Therapy Application, Massage Therapy Assessment and then click the grade exam button at the bottom of the page. Your practice test results will be displayed along with a rationale explaining why the correct answer is correct. If you are interested in sampling even more massage questions you can register for a FREE 24 hour trial of our entire database of over 3000 questions. Or take a look at our exam prep products. 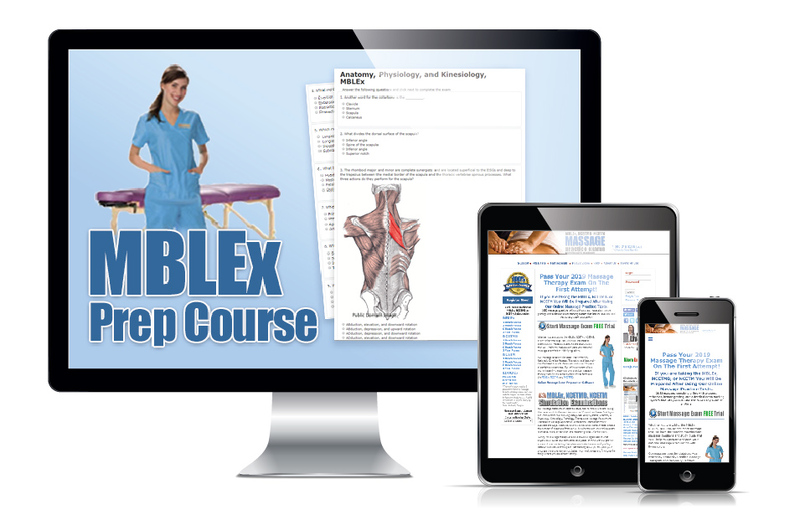 Register Now for our MBLEx prep and get instant access to over 3000 Massage Questions, Answers & Rationales. 100% Pass Guarantee!